Sometime in the 1990s - I forget when - I bought a Lot in an auction held by the nice Hamburg firm of Schwanke und Sohn. 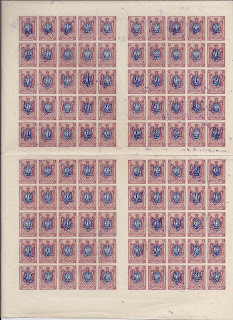 The Lot comprised about 20 000 or 30 000 Trident overprinted stamps, nearly all in complete sheets. The sheets were neatly folded but just once in the middle and they had been very carefully stored. Some sheets had pencilled remarks in the margins, always accurate. Most of them were common stamps and all were genuine. Over the years I have sold most of these stamps - and probably given away some of them in desperate moments. Today I came across a few sheets which remain. Here is one sheet. 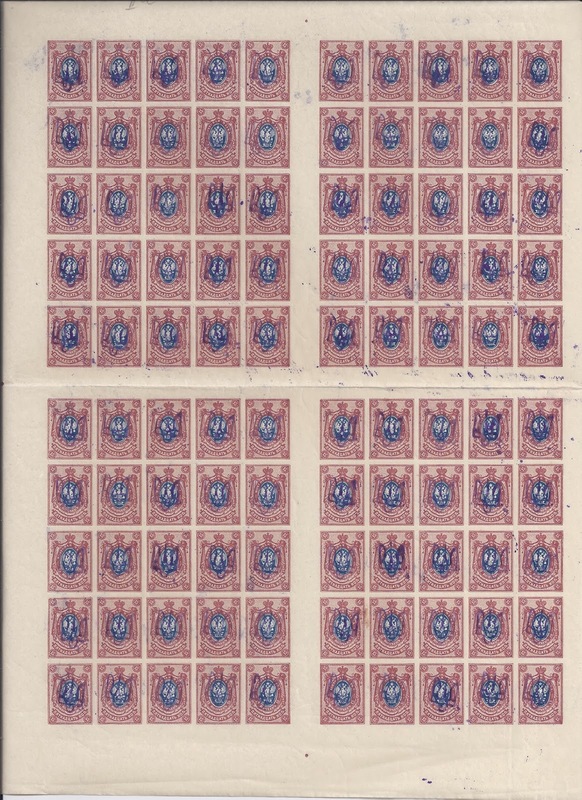 These are 15 kopeck imperforate stamps overprinted with Kyiv type 2 using a single handstamp type 2a. This is # 285 in the Bulat catalogue where it is priced at - - mint and $55 used. I think there was a second identical sheet or part sheet which I cut up into strips of 5 to supply clients with Bulat - based (or Seichter - based) Wants Lists. There has never been any temptation to cut up this sheet. There does not seem to be a queue of people looking for Bulat # 285. Material like this is a bit of a headache, really. The sheet is not attractive. There are no Zeppelins. The obscure variety it illustrates is of interest to almost no one. And the stamp is priceless.